The reviled Sorcerer of Nurgle Necrosius, the Master of the Apostles of Contagion, also known as the Hand of Nurgle. Following the Vraksian war his whereabouts are unknown. 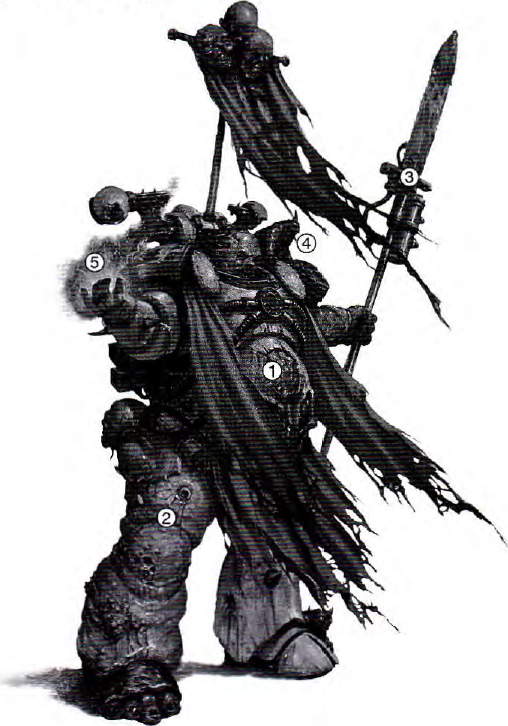 Necrosius' armour is a corrupt relic; although incomplete it appears to incorporate elements of MK IV and MK V Astartes power armour along with augmetic modifications of unknown origin, including what appears to be a dangerously unstable power core venting contaminated blackish-yellow vapour. Necrosius himself appears to have partly fused with the armour as it has been damaged or burst in order to accommodate his mutated form, to the point where it is impossible to know where the sorcerer ends and the armour begins. Fallen far from the glorious form of mankind and the sacred triumph of the Adeptus Astartes physiology, Necrosius' body has become subject to the warping effects of Chaos. This has manifested in horrifically bloated necrotic mutations, swelling of flesh and what appear to be numerous cancerous lesions and the stigmata of uncounted diseases and infections. The gifts of Nurgle usually take the same form, disfigurement and contamination with diseases of the skin. These often (but not always) cause bloating of the flesh - as seen clearly here. Such a severe case of neurofibromatosis, with attendant tumours should induce chronic pain, but it seems not to affect Nurgle's followers in any way. Subcutaneous tumours have caused the flesh to expand. Cysts have formed and then burst, spewing blood and pus. Skin lesions of this severity would be fatal to any mortal, but Necrosius and his ilk welcome such infection as a sign of their god's favour. To their corrupt minds such insightly dermatosis simply adds to the warband's fearsome appearance and acts to intimidate those that must fight them. Despite its seemingly decayed and rotting state, Necrosius' body appears able to shrug off extremely serious injuries, with unconfirmed reports of his flesh almost instantaneously healing the damage done to it by las-fire and bolter rounds. In addition the sorcerer appeared able to withstand any degree of ambient pollution, including the deadly toxins and gases employed by his own side in the conflict without additional protection. Force Glaive. As encountered on Vraks, Necrosius appeared to be armed with a heavily modified force weapon, based or perhaps converted from an Imperial design of the kind favoured by Space Marine Librarians. The psycho-responsive metal of the force weapon allows a psyker such as Necrosius to focus murderous energies into the blade, rendering it able to cleave through even hardened ceramite and directly sever the life force of an individual wounded by it. Bolt pistol. Not visible here, but Necrosius is known to be armed with a bolt pistol, which he has personally adapted to fire 'plague bolts'. The warheads of each bolt are converted to contain biological warfare agents, which are scattered when the bolt explodes. These are believed to be adaptations of the psyker's own invention. Blight grenade. Also known as a Death-head of Nurgle, these are highly effective improvised grenades. Each is made fro mthe head of a conquered enemy. The more powerful the enemy the better, so enemy champions are highly prized. The head is sealed with wax and then filled with infectious blood, pus, acid and other putrid creations and allowed to rot down. The result is a missile which will burst upon impact, the internal pressure throwing out infectious liquids and gsaes in all directions. The tiny, impish daemons of Nurgle are called Nurglings - each is a small replica of Nurgle himself. Their small size should not be mistaken for any lack of threat. They are vicious creatures, attacking in swarms that bite and claw with infected fangs. Their festering bites will quickly make a minor wound turn dangerously gangrenous. Nurglings attach themselves to the most powerful and favoured servants of Nurgle. The use of warp-power will often incur physical manifestations of power, summoned from the ether. Most commonly this might be lightning or flashes of energy, but the use of psychic activity has been noted to cause all manner of other manifestations, from rapid temperature changes, sudden winds, disembodied voices, screaming or howling, unexpected levitation, to inducing fits or uncontrolled psychotic episodes. Necrosius is also adorned with the blasphemous and macabre trappings of a sorcerer, including shrunken heads, fetishes, glyph-carved icons and a personal banner bearing the foul symbols of Chaos, harvested body parts and the like. These totems are thought to have use in ritual practices providing a psychic focus for the sorcerer's malign energies as well as fulfilling other symbolic functions.